Heading into the the California Collegiate Athletic Association tournament with a 33–19 overall record and 23–15 in CCAA play, the Tritons find themselves in fourth place, just enough for a tournament berth. UCSD finished the regular season on a high note, sweeping the final doubleheader against Cal State San Marcos. Unfortunately for the team, it gets a lot harder from here on out. The Triton bullpen ranked sixth in the conference. Led by senior pitcher Lexi Edwards, the group finished with an ERA of 3.06, allowing 378 hits, 177 runs and 25 home runs. UCSD’s batters also had a strong season, with a batting average of .301 off of 410 hits and 252 runs but just 12 home runs. The team ranked fourth in on-base percentage, with a commendable .378 average. Sophomore outfielder Kelsi Maday stood out on offense with a batting average of .376, earning 59 hits, 50 runs and a team-high five home runs. Maday and Maddy Lewis each had no trouble getting on base, making a trip to at least first base 46.5 and 44.2 percent of the time, respectively. First up on the docket is Humboldt State, which the Tritons split their games against. Coming into the tournament on a 20-game winning streak, the 45–3 Lumberjacks will prove to be a tough test for the Tritons. Interestingly enough, UCSD actually handed Humboldt State its last loss of the season on March 31, a game that ended in a final score of 6–5. With an ERA of 1.26, the Lumberjack pitchers lead the conference, allowing just 257 hits and 10 home runs for the season. The Lumberjack hitters are similarly impressive, with a batting average of .299 off of 391 hits, 274 runs and a conference-best 36 home runs. They don’t have a problem getting on base either; with an on-base percentage of 0.402, the Tritons will likely have their hands full in all phases of the game. If the Tritons get past the Lumberjacks, they very well may find themselves facing second-seed Chico State. Facing off against the Wildcats four times this season, the Tritons were only able to steal one win against the 36–12 Chico State team. The Wildcat pitchers, while not as impressive as the Lumberjack bullpen, rank second in the conference thanks to their ERA of 1.81. Allowing just 234 hits, 116 runs and just nine home runs, Chico State would be just as tough a matchup for the Tritons. The offense is no slouch either, as it finished with a batting average of .298 for 382 hits, 18 home runs and an on-base percentage of 0.381. The final scenario, if the Tritons make it past the Lumberjacks, is a game against the Seawolves. Despite having a worse overall record than the Wildcats and the Lumberjacks, the 32–20–1 Seawolves proved to be a tough matchup for UCSD, as they split their four games in the regular season. Continuing the trend of strong pitching, the Seawolves’ bullpen ranks third in the conference with an ERA of 2.20. Led by junior pitcher Amanda Llerena, with an ERA of 1.63, their pitchers allowed 338 hits, 158 runs and 21 home runs on the season. Arguably the weaker aspect of their game, the Seawolves’ hitters ranked seventh in the conference in both batting average and on-base percentage. Still, they were able to get 414 hits, 216 runs and 25 home runs. 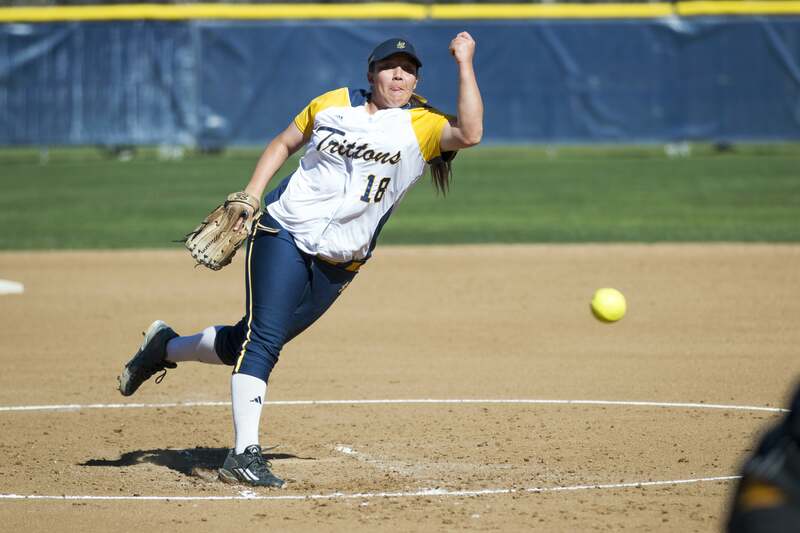 UCSD plays Humboldt State on April 29 at 3 p.m., while Chico State plays Sonoma State later in the day at 5:30 p.m. Both games will be played in Stockton at Arnaiz Stadium.